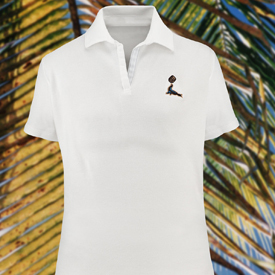 Classic short-sleeve polo shirt is cut from soft piqué cotton. - High Tech moisture management double tuck piqué fabric, self goods collar, hemmed sleeves. - Easy Care, anti pill, and wrinkle resistant fabric. - Sized and styled for women. - Black Seal logo embroidered on left chest.